In the past, when the joiner found it really cramped working with a screwdriver on prefabricated houses, roofs and stairways he had no choice but to use a hand ratchet. That ’s now a thing of the past. The FEIN Mammut offset screwdriver shows its exceptional strength particularly when driving screws in cramped places. Thanks to its driving shaft tilted at 90° the extremely compact gear head and direct universal 1/2, tool holder, it requires very little space for the job involved. You can therefore drive in your screws quickly and expertly in places that are difficult to access. With up to 70 Nm, the FEIN Mammut is the most powerful offset screwdriver on the market for soft material  a real “power” tool. The FEIN Mammut is not only superior to the classic screwdriver with pistol grip or D-handle, it also exerts far less strain on your wrist. And thanks to its special design, the extremely high torque is mastered with ease, even without a clutch. The FEIN Mammut is ideal for working with wood screws up to a shaft Ø of 16 mm, dowel screws up to 14 mm Ø, threaded pins, sleeve fasteners and door-frame dowels  i.e. for all screwdriving jobs on soft material in cramped places that require a high torque. And with the drill chuck supplied as an accessory, you can convert your screwdriver into a high-performance hand drill in a jiffy. 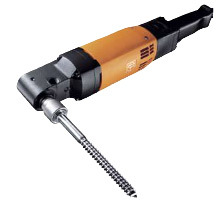 Call us at 877-702-8665 for assistance with the FEIN offset screwdriver. Offset Screwdriver up to 5/8"
Powerfull Screwdriver for heavy duty wooden assembly jobs. Max. torque for soft joint opperation, approx. 1 wrench socket insert each of size 13,17,19, with 1 spacer 1/2" and bit each on 1/4" and 5/16" hexagonal socket. 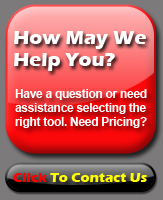 Have a question or need assistance in selecting a FEIN deck drywall screwdriver?